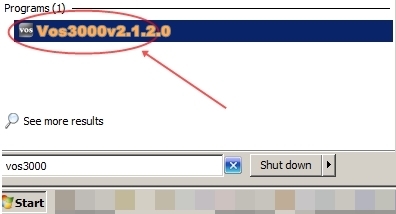 Depend on your version choosen, save the file Vos3000-client40.exe or Vos3000-client2124.exe or Vos3000-client2120.exe to your hard disk, then run it to setup program, once you are done, you should see the link "VOS3000 2.1.4.0" or "VOS3000 2.1.2.4" or "VOS3000 2.1.2.0" in StartMenu -> Program Files, open it and input the your account to login and use it as management tool for your softswitch activities. Save the file Vos3000-useguide.pdf to your hard disk, open it with PDF reader program, then you can apply documents for your settings with your softswitch. Note: This file is just for reference. Open the right version, you should see version label on the login form, make sure it matches to the login details given and version required for that login. 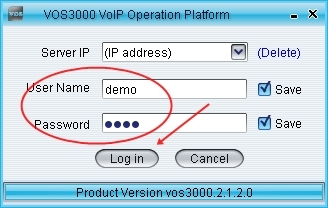 The software is very useful for wholesale termination, our price is very cheap and we have support for our members to create configuration for origination/termination in buying and selling telecom minutes. The demo users try the software himself via documentation given. We provide dedicated server with switch pre-installed. 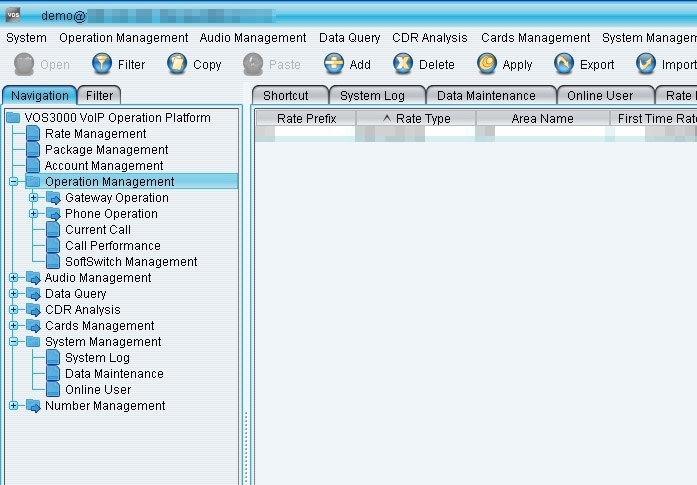 Customer's data is run backup daily if it is requested. The server is unmanaged or semi-managed depending on customer's decision. if cutsomer has own server, we can provide switch service by request. For longtime business, we provide you the valuable service, not work for a day. To buy the hosted service, just make payments, and we will follow up the request, send you the account information, then you can log in to use and change to your new password. If you have questions, just communicate with us via contact center. Thank you.